Men’s hockey breakdown: BU versus Cornell — who has the edge? The ultimate goal for any NCAA Division I hockey team is simple — be the national champion. After almost six months of college hockey, the field of 60 teams has been narrowed down to 16 that have hopes of making it to the 2018 Frozen Four in St. Paul, Minnesota. In this year’s Northeast Regional, Boston has two teams playing in Worcester: the No. 13 Boston University men’s hockey team and No. 8 Northeastern University. However, for the Terriers (21-13-4, 12-8-4 Hockey East) to get one step closer to the Frozen Four, they will compete in a rematch of November’s Red Hot Hockey matchup against No. 4 Cornell University. 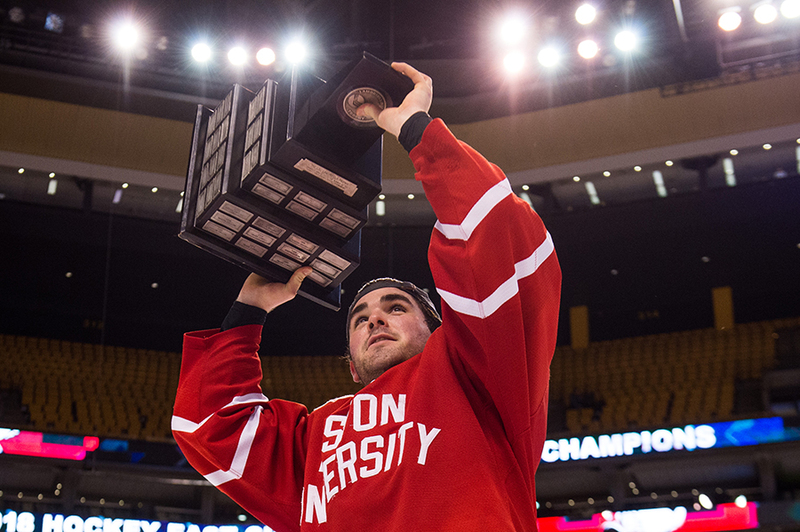 After winning the Hockey East championship last Saturday, BU is set to take on Cornell (25-5-2) for the third time in the national tournament. With that being said, The Daily Free Press has broken down each team and determined which team has the advantage. Prior to the Hockey East semifinal victory over then-No. 14 Boston College, BU head coach David Quinn said in a teleconference that he feels like he has two first lines. As of late, Quinn’s first line of forwards has consisted of freshman Brady Tkachuk, junior forward and assistant captain Jordan Greenway and graduate transfer Drew Melanson. His second line features freshmen Logan Cockerill and Shane Bowers, and junior forward and assistant captain Bobo Carpenter. His top six features three players who have already been drafted (Greenway, Cockerill and Bowers), a top-five North American skater for the upcoming 2018 NHL Entry Draft (Tkachuk), an Olympian (Greenway), the Hockey East tournament hero (Melanson) and his leading-goal scorer (Carpenter). With that level of talent, BU has arguably the best top two lines in the NCAA tournament this year. The Terriers’ forwards have put up 226 points this season, which is 24 more than the Big Red. BU’s total also does not include freshman defenseman David Farrance, who put up five points while playing as a forward. Cornell is led by junior forward Anthony Angello’s 26 points. Only one other player on the team, senior forward Trevor Yates, has at least 25 points. However, the Big Red have 10 forwards with double-digit points, in contrast to the Terriers who have eight. Although Cornell has a slight edge in scoring depth than BU with its forwards, it’s hard to pick against a top six that could have five players in the NHL one day. Each game, Quinn is put in an interesting position as he must decide which six of his seven drafted defensemen he will play. He has shown a willingness to play all seven by either going seven d on the blue line or by playing Farrance as his third-line left wing, a move that went on for over a month. Farrance has played the two last games as a defenseman where he rejoined the a talented d-core. The group features one first-round draft pick (sophomore Dante Fabbro), two second-round picks (senior John MacLeod and sophomore Chad Krys) and four third round picks (captain Brandon Hickey and freshmen Cam Crotty, Kasper Kotkansalo and Farrance). Although not drafted, senior Brien Diffley has appeared in 17 games and boasts a plus-minus rating of two. Fabbro’s 78 blocked shots is good for a four-way tie for No. 11 in the nation. In terms of getting offense from their d-men, the Terriers’ blue line has generated 96 points this season compared to the Big Red’s 67 from its defensemen. Fabbro and Krys each found the back of the net in November’s matchup between these two schools. However, Cornell features three of the top four leaders among defensemen in plus-minus — juniors Brendan Smith, Matt Nuttle and Alec McCrea, who have a plus-minus rating of 22, 22 and 21, respectively. The Big Red have five defensemen with rating of 10-plus or higher, compared to the two (Kotkansalo and Crotty) from the Terriers. In probably the toughest category between the two squads, it is essentially a toss up as to which team has the advantage. This is probably the most intriguing matchup up between these two teams. In one net will be Hobey Baker Memorial Award candidate and Mike Richter Award (most outstanding collegiate goaltender) semifinalist Cornell freshman goaltender Matthew Galajda. In the other will be the Dallas Stars No. 26 draft pick BU sophomore goaltender Jake Oettinger. Galajada’s leads the country in goals against average (1.49 goals) and shutouts (nine), and sits third in save percentage (.940). Although Oettinger has rebounded from a rough first half, he still allows almost one more goal per game (2.42) than Galajda and has a .916 goal save percentage. However, that does not mean Oettinger can’t shut down an offense, as his five shutouts include one against No. 7 Providence College this past weekend. This is the most clear cut category. While Oettinger has shown glimpses of being the best goaltender in the country, right now Galajda plays like a top-five netminder in the nation. On paper, it is the No. 4 team taking on the No. 13 team. However, the teams are more evenly matched than what the rankings might imply. Out of all the opening round seeds, BU more than likely has the best chance for an upset. Hockey is a very difficult game to predict as anything can happen, but we have made a prediction. FreeP’s prediction? 2-1 BU in overtime. “With that level of talent, BU has arguably the best top two lines in the NCAA tournament this year.” There are arguably up to a half dozen teams that have a better top 6 than BU.